Figure 1. A synthesized spectroastrometric signal, with the left panel representing the bluer wavelength dominated by the planet and the right panel representing the redder wavelength dominated by the moon within an absorption band where the planet’s spectrum is dark. The offset of the right image indicates that the flux is being given off by a probable moon. Figure 1 in the paper. There are 182 moons (and counting) in our Solar System that come in all shapes, sizes, and compositions. In fact, there are more moons in our Solar System that are known to harbor liquid water than planets. Jupiter’s moon Europa and Saturn’s moon Enceladus (thanks to this recent study) are believed to harbor global liquid water oceans beneath their icy crusts, possibly offering us the best opportunities for finding life elsewhere in the Solar System. Though we are far from adequately exploring these moons, astronomers are already looking at ways to study moons around planets outside of our Solar System, known as exomoons. Many factors go in to whether an exomoon may be habitable (see this astrobite), but the abundance of gas giant planets discovered orbiting in the habitable zone of their stars may mean that there are many rocky moons with temperate climates, and planet-moon interactions may lead to heating of exomoons that do not occupy the traditional habitable zone. Though none have yet been confirmed, attempts to indirectly detect these extrasolar satellites around confirmed exoplanets are underway; most techniques for doing this involve finding perturbations to the exoplanet’s transit signal and are discussed in this and this astrobite post. Today’s paper instead looks at the future of exomoon detection by investigating how upcoming telescopes could directly detect exomoons and subsequently uncover a wealth of knowledge from these systems. The authors consider a technique dubbed “spectroastrometry”, which as you may have guessed combines spectral analysis with astrometry, or looking at the precise movement of celestial bodies. The key to this idea is that the exomoon outshines the exoplanet at certain wavelengths of light, and likewise the exoplanet outshines the exomoon at certain wavelengths. If a telescope were large enough, had fine enough spectral resolution, and sufficiently blocked out the light from the system’s host star with a coronagraph or starshade, the moon-planet system could be identified and separately resolved by looking at the system at different wavelengths of light, as demonstrated in figure 1. Figure 2. The flux of the Earth-Moon analog system orbiting Alpha Centauri as a function of wavelength in microns. The top panel shows the flux density of the Earth (blue) and Moon (gray) analogs of the system. The bottom panel shows the percent of the flux density that is due to the Moon as a function of wavelength. Note the absorption features caused by the presence of oxygen, water, and carbon dioxide in the atmosphere of the Earth. The Moon’s spectrum is governed by reflected Solar and emitted thermal radiation. Figure 2 in the paper. The detection of exomoons using spectroastrometry was analyzed in this study using two fiducial examples of exoplanet-exomoon systems in the habitable zone of a star: an Earth-Moon analog orbiting Alpha Centauri (1.34 parsecs away), and a Jovian planet with an Earth-sized moon orbiting a Sun-like star 10 parsecs away. Part of the spectrum of the Earth-Moon analog is shown in figure 2. Clearly, there are parts of the spectrum relatively close together in wavelength where the moon’s and planet’s individual fluxes dominate the total system’s flux, providing the best target for spectroastrometric analysis. 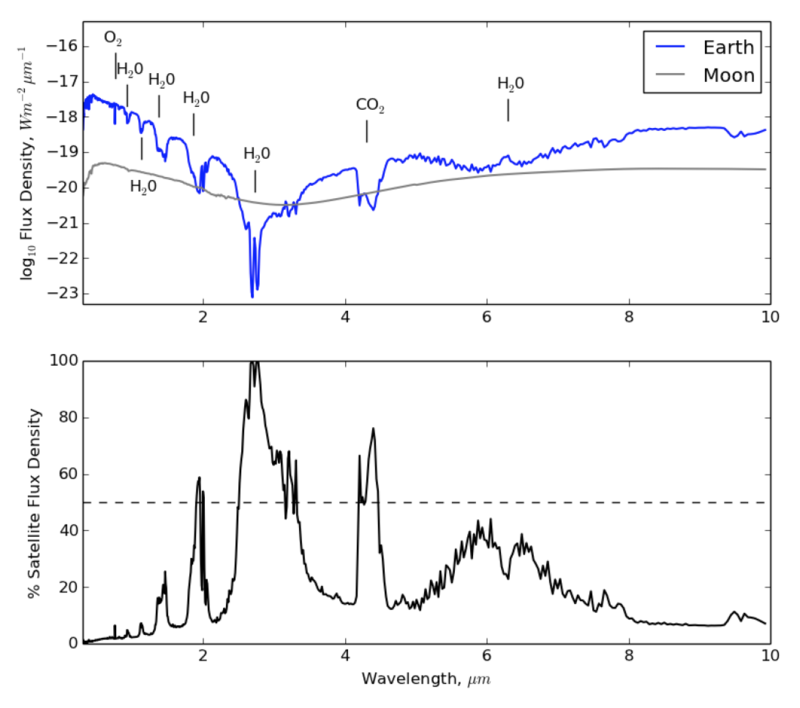 In the infrared, the frequency that the Moon would most dominate in the Earth-Moon analog is the water band at ~2.7 microns (see figure 2), where water in the atmosphere of the Earth absorbs the most light. At this wavelength, the Moon accounts for 99.8% of the total flux of the Earth-Moon system. Comparing the sky position of the system at this frequency and a slightly higher frequency (where the planet dominates the flux) would allow the spatial separation of the planet and moon, such as in figure 1. No current telescope can spatially resolve these example systems, and planned “next generation” telescopes like JWST (6.5-m primary mirror) will also have insufficient angular resolution. As an example, the spatial resolution needed to separate the Earth-Moon analog orbiting Alpha Centauri would be ~2 milliarcseconds in the infrared, whereas the Hubble (2.4-m primary mirror) would only be able to resolve objects with a separation of ~100 milliarcseconds at these wavelengths (and is not equipped with a coronagraph to block out the light of the host star, anyway). However, these abilities are expected to be within the capabilities of proposed second-generation telescopes like the 12-m High Definition Space Telescope. Figure 3 illustrates in the size of an infrared space telescope (equipped with either a coronagraph or starshade to block out the light of the host star) that would be needed to detect an Earth-sized moon orbiting a warm Jupiter using spectroastrometry in the Solar neighborhood. One of the most exciting prospects of this method is that it will let us do more than just detect the presence of an exomoon; if we can spatially resolve the moon we may be able to look at the spectral features of its atmosphere to gauge if the moon is habitable or contains biosignatures. Also, the large exomoons that we will be able to characterize with spectroastrometry will be on our galactic doorstep, meaning that a trip to Pandora may be closer than we think. Figure 3. Minimum telescopes diameters needed for an optimal space-based telescope to detect an Earth-like exomoon orbiting a warm Jupiter between 0.45 and 0.89 microns with 5-sigma confidence using spectroastrometry. 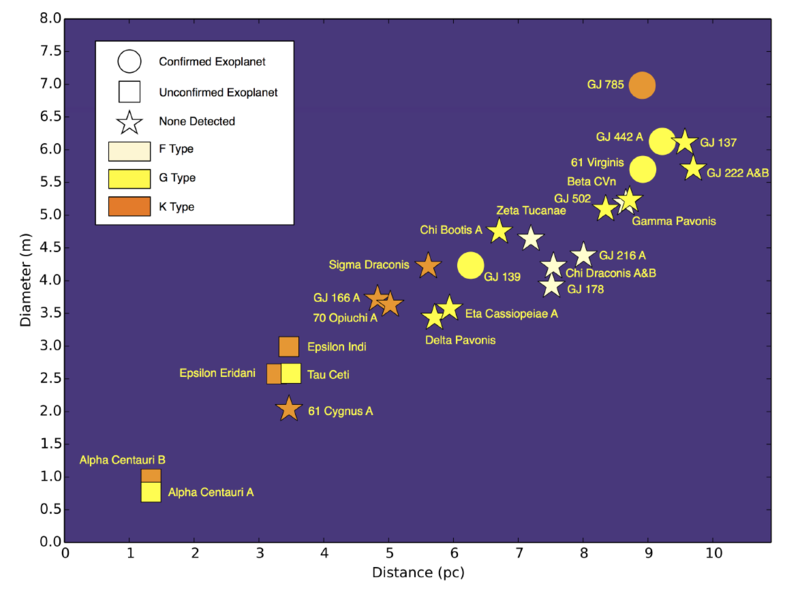 The nearby stars (less than 10 parsecs away) are plotted at their given distance. The legend indicates the colors that correspond to stellar type and the shapes that correspond to whether exoplanets have been detected around these stars. Figure 12 in the paper.